Everything About Labels in Blogger. ~ The Blog Doctor. You are here: Home > Labels > Everything About Labels in Blogger. Everything About Labels in Blogger. 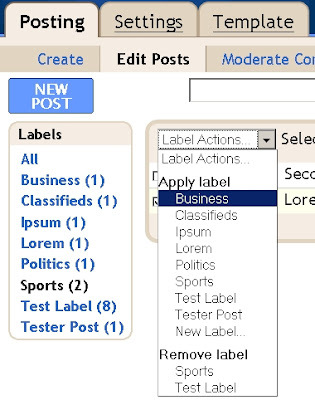 Labels are applied in the bottom frame of the post editor while creating a post. Login to Dashboard and click on +New Post. 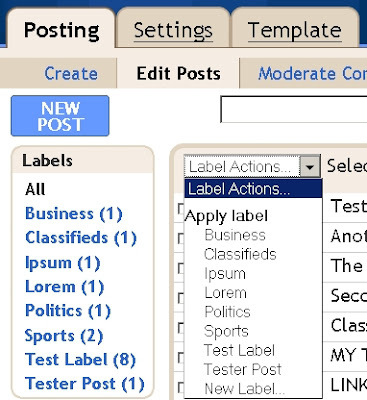 The post editor opens and after you have finished typing your post add each Label separated by comas in the bottom frame and then publish the post. To remove a label login to Dashboard and click on Posts to bring up the posts list as before. Check the boxes of the posts you wish to remove the label from and click the down arrow next to Label Actions and then click label name under Remove Label. 1. APPLY RELEVANT LABELS : The Label name should correspond with the content of the post. For instance I could label this post "Youtube" since it is one of the top tags at Technorati and hope to get a lot of traffic from there. But that would be spamming and the traffic will never return after being disappointed on getting no information on Youtube! 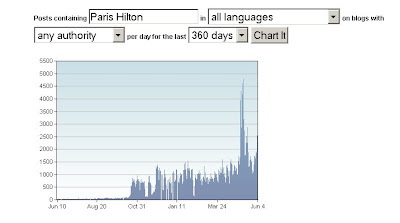 If you make a post on Anna Nicole Smith today you will not get as much traffic as interest in her has decreased while if you make one about how Paris is going to spend her days in jail you will get traffic but you will also be competing with a lot of other posts. 3. 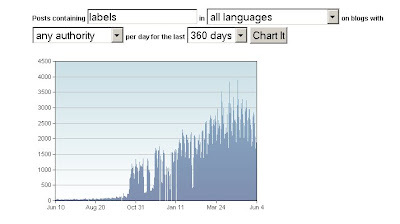 NUMBER OF LABELS : Too many labels cause duplication of content and pages and there is more danger of landing on Google's Supplementary Index. I would suggest to apply only one or two labels per post to get around this problem. FTP blogs do not have access to the new Layouts template due to the new dynamic publishing technique used by the New Blogger. There are other users who prefer to stay with the Classic Template. In both these cases labels when applied will appear below your posts but you will have to add label links to the sidebar manually . Replace the CAPS with the links to each label and their corresponding label names. Save Template. Do you have too many labels? Perhaps they are making your sidebar extend too long. Here is the remedy to create an expansion drop-down box. 96 VIEWERS CLICKED HERE TO COMMENT ON THIS POST. ADD YOUR COMMENT. I knew I'd find the answer(s) I needed here, which is why your site is one of the first I listed at Blog Band-Aids! I came today in search of 'how to hide new blogger labels'. Lo and behold, this info was the first that I saw. I also needed expandable list info, which I've now added, thanks to you. My blog looks a lot neater now. PS I want to 'Hide Labels' as an expandable line in new Blogger... But exactly where would I place the expandable code so that each post has a drop-down Label in the footer? Seriously, I am thinking of starting a meme myself and in the process proving myself to be a real thinking blogger!!!! I have removed all the post from a label, but why the label still shown there are still got 1 post under that label? and i could not delete that label because it shown still got 1 post under it ? what can I do if I still want to delete that label and keep others label working? Login to dashboard and click on Posts. Then in the list of posts which opens click on edit link for the post which has the label. That post will open in post editor. Delete the label in the bottom frame of post editor and publish the post. I'd love to use labels but I haven't found a way to place them below the [ Read More ] link. In the template there's nothing like "labels" or such. Thanks a lot, great site. "Showing posts with label The Four Seasons: SUMMER. Show all posts"
I want to change "Showing posts with label" to "Showing" and change "Show all posts" to" Home"
I cannot find anywhere in the html where I can make this change - I'm just starting - no css/html experience. YOUR site has been my school. THANKS. Hope you can help with this. TO WHAT YOU WANT. Experiment and see what you get. BACKUP TEMPLATE BEFORE MAKING ANY CHANGES. I've been wondering if I could put my Labels into an expandable drop down box from Flooble, and am delighted to see here that it's do-able. I do have a question for you though... what code would I use to do this? Where do I get or how do I create the code for my labels? I need a code to put into Flooble to create the box. Thanks so much for your help. I've added your button to my blog sidebar. Try putting the code around the Labels widget in the sidebar on the Template---->Edit Html page. I keep thinking about this and re-reading what you wrote... so went and copied the code that I "think" you "might" mean. It didn't work! Guess I'll have to wait until you have time to get back to me on it, haha. I'll go out for a few hours with friends and get my mind off this, lol. Oh ya... also with putting your button on my blog... it didn't work right, but it's there as it is. If you like you can go see it... scroll down to the bottom and it's in the sidebar. Is there a way to get more than 20 posts listed after you click on a certain (manually added) label in the sidebar of the Classic vesion of Blogger template? Of course you will have to update the number in the link manually everytime you create a new post with that label. thanks a lot - everything works perfectly! Love it! Love it! Love it! Done and dusted and too easy. I'm all sorted into beautiful categories thanks to you.Thanks a million. Question... I've just added a new labels "#Requested"... why do I need to write it whole every time? All other labels i just need to type first 2-3 letters and they appear... any ideas? Is it because you added a '#' before the label name? hm any ideas how can I hm edit it or something? apologies if you've already answered this question before - if so just point me to the answer. I want to organise my lists of labels in the side-bar so that I have one for places e.g. Ecuador, India and one for themes e.g. Shopping, food, rather than having them all in one long list. Can you tell me how to do this? Add Link List Page elements to your sidebar. In one add all the label links for Ecuador and give the page element that title. Repeat for the others. I must say I love the content on your blog! It's been a life saver. Every time I have a question, this is the first place I go to. I have a question with labels that I don't know the answer yet. When I first started out I labeled a couple of posts with words in small caps. I have since labeled everything with Sentence Caps but I cannot figure out how to change the first ones. I tried deleting those but it didn't seem to work for me. The labels that are giving me trouble are: history, vintage, ads, computer. ps. let me know what you think of the blog! I don't think putting CAPS in a label in any manner alters it's function. They are indexed by the search engines however you CAP them and only based on their meaning. "I don't think putting CAPS in a label in any manner alters it's function. They are indexed by the search engines however you CAP them and only based on their meaning." I completely agree that the spiders will search independently of the caps, my concern is purely an aesthetics one. Can you help? You cannot delete the labels on the List of Posts page as shown in the post above? What are the problems you are having? Describe every step and the obstacles in detail. I actually found a solution to my problem. All I had to do was clear the tags from all existing posts in order to erase it from the system. Later I could retag with the proper capitalization and presto! Thanks anyways for all your help in this and all my other problems in the past (and surely future). Hi! I am just wondering how you code that label system on top of your posts ie. the one with the Windows folders. I am also interested in finding out which part of the HTML will affect the physical location of my label system as I needed them to be on the right side of the posts, not on the top. Thanks! PS: I am using the Classic templates ie. HTML. Have a look at How to Classify Blogger Labels? Try pasting the code in the sidebar part of the template. Hi! I have just read your replies... Am I right to say that the sidebar portion of the template is marked as "sidebar" in the HTML code? If you can share your blog address I will be able to help you better. I Need the same answer that Taffeta Darling. It´s works fine!! Thanks you a lot!!! My labels page element does not have an edit HTML button. I want to create a working drop down box that will contain my labels and can be added to with each new post. I am not clear how to use the flooble script to make this happen. Is there another way? Try clearing the Cache. Use Firefox browser. See if Edit link reappears on Label Page Element. I use Firefox. I have cleared cache and nothing changes. First backup your widgets data. Then click the Revert Widget Templates to Default. link below the Template Code box on the Layout---->Edit Html tab. I am switching to blogger from wordpress and I would like to have "sub pages" on my blog (as in wordpress). From what I have read you can do this with Labels. However, it seems I can't have the post show up *ONLY* in the labeled area, it shows up on the main page as well. Is there a way to "hide" the post from the main page and have it show only if the label is clicked on? I'm not terribly savvy with coding, but I will try if that's what it takes! Thanks SO much for the time and effort you put into this site. It's amazing! To prevent any post from appearing on the Main Page just backdate them. See How to Change Post Order? You better have a new template layout, it look very untidy though the copied content are fine. I have the same problem as DG. My labels appear on the sidebar but not below the post itself. The blog was originally classic but I migrated it into beta around one year ago. I've tried checking the code but has no clue about what is wrong with it. What is the blog address? Great site (although the design is certainly an eyeful), and everything is very helpful. I also love that you actually take time to answer individual questions. Because of that, I was hoping you could answer mine. Simply put I would like to change the word "Labels" to "Pigeonholing" (to go along with the tag grouping in the right sidebar). How would I go about doing this with my blog's HTML template? Click the 'Expand Widget Templates' checkbox on top of the Template Code box on Layout---->Edit Html tab. Wait for template to expand. Replace the '<data:postLabelsLabel/>' with "Pigeonholing" without the quotes. It depends on which template you have. Also see Parts of Template. "Showing posts with label LABEL_NAME. Show all posts"
Have a look at How to remove the status message? the labels show on my sidebar but dont under my posts.Why is this happening ?? ive tried it so many times !! Check the Label option in Blog Posts widget and save. Then clear cache. Great post and i found a lot of answers i didn't know i had questions about. The one thing i don't think i found was the way to remove unwanted tags from the popup menu that appears when you enter a tag. I've removed all the labels from posts that i don't want, but when i click on "show all" next to the "label this post" box, all tags ever used, including ones i don't want, appear. How do i get rid of those? Thanks for looking and responding! When you go to 'Edit Posts' from Dashboard your labels are listed in left column. Do you see your deleted labels there? Well, Doctor Vin! Everything appears fine now! Maybe i wasn't refreshing the page enough. You know this "dashboard" thing is great when you have an idea what you're looking at: i don't feel like such a big Dummie anymore. Thanks for the little bit of handholding. Click Layout---->Page Elements---->Edit link in Blog Posts widget and check the Labels option and save. i did,nothg is still coming ..cleared the cache too so what do i do ? Try this : Go to Layout---->Edit Html and scroll down to below the Template Code box and click on "Revert Widget Templates to Default" link. You will lose customization of your gadgets so Backup your Gadgets Data first. hi, i have a question but im not sure if it's suitable asking here. anyway i hope u would guide me to the answer anywer if u already have it posted. my question is, is it possible for me to set some of my posts under the same label as private? lk it is published, but only me or some allowed users can read it? (only some selected posts, not the whole blog). Sorry! This is not possible in Blogger at the moment. All posts in a blog are either private or public. A blog cannot ave some public and some private posts. Instead export those posts into a brand new blog and make that blog private. hey vin thanks a lot for the help but i have a little problem here, i cant do as u say to export my blog, bcz i dont have an export/import blog button. i think it must have been bcz of some settings i have chosen while creating the blog. is there anyway i can change the settings? Login at Draft Blogger and then go to Settings---->Basic---->Blog Tools for the Import/Export Blog links. Click on 'Revert widget templates to default' link at the bottom of the Template code box on Layout---->Edit Html subtab. Thanx Vin for ur interest and helping me out of this critical problem. And you are doing a good job man !! Not possible at present. Only way is to press space bar before typing the the next label in the post editor to get rid of the auto suggest. I have labels in my side bar for easy navigation, but the labels also show up under the blog posts that they belong to. How do I remove from blog posts and just have labels in the sidebar? Click Edit link on Blog Posts gadget on Layout---->Page Elements subtab and uncheck Labels option and save. when i will click on main course it must show links of all posts(not whole post)under that category and when i will click on particular link it must show only that post.could u tell me, is this possible using labels? Have a look at How to Classify Blogger Labels. It is a Text List gadget in which are pasted links of Label Pages. I think I am making a really big mistake. I used labels as if they were keywords. So fter 80+ articles I have 200+ labels applied to my posts. 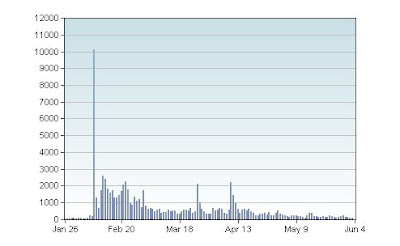 By the way I am not getting much traffic from google search. Should I remove them and leave say 20 would make things worst? I also had removed the labels widget, is it a problem? Do not remove labels widget. There is no limit on number of labels. You can have as many as you like. More labels there are is better. Labels are used by search engines to index blogs. Your keywords should be put everywhere in blog. Also see SEO Tips for Bloggers. Other factors may be responsible for low traffic from Google Search. Vin i m sorry but i didn't get ur answer "It is a Text List gadget in which are pasted links of Label Pages. "can u explain how to add that text list gadget? Add it like any other gadget. You have to paste links code in it manually in HTML.Better to use a HTML gadget rather than a Text gadget. Hi vin,I m really sorry I didn't get that,I know that widget and also know how to add that.In the blog which I requested u to see(http://chakali.blogspot.com/)when i click on something in the sidebar it opens list of post links(not whole post)and 'showing posts with label 'blablabla'' displays on the top of list and http://chakali.blogspot.com/search/label/Main%20Dish?max-results=100 in the address bar. If I add html element and links of post label it directly displays in the sidebar,I don't want that,could u plz help me and explain it one more time? That is a complex hack which cannot fit in a comment. Subscribe to the blog feed as I will make a post on it when I get the time. If you do not want a post to appear in Main Page of blog change the date of the post to a date in the past. I want to list all the post names under each category in my sidebar. and so on..sports being my label and tennis and cricket my posts. how do i do this. And this list should automatically show the post names as I keep publishing them. Help me out in this regard. If at all there is a similar post here please redirect me there. Thank you very much. I really appreciate. I managed to improve my blog and I believe my viewers will appreciate it as well. i wanna run a classified portal then i wana a code to display lables in blog post is it possible? is there a way to hide selected labels?? Like say, i work with 4 labels on my blog: Label1, Label2,Label3,Label4. When the blog posts r shown on homepage/post page (or anywhere), i want that even though the post has been labelled Label3, it doesnt show. For example. Say a post has been labelled with two labels: Label1 and Label3. But i want to hide label3 , and want only label1 to appear with the post, is there a way??? Hi Vin! First let me thank you for all the fantastic info and help you provide, I appreciate it very much!!! I do have a question though... I added the label gadget to my blogger blog to make a label cloud. It worked just fine but now the labels ALSO show up under my posts and I can't figure out why. You can see it on my "Avon Beautiful" blog. Please let me know if there is anyway to lose the post-footer labels. do you know how to place each post label in metatag description?